These delicious bite-sized cakes are crispy on the outside with a soft, cheesy center. They are perfect topped with your favorite shredded BBQ, grilled shrimp or warm sautéed collard greens. Place milk, stock and salt into a large, heavy-bottomed pot over medium-high heat and bring to a boil. Add cornmeal once liquid comes to a boil and whisk. Once all of the cornmeal has been incorporated, decrease the heat to low and whisk frequently, every 3-4 minutes, to prevent grits from sticking or forming lumps. Cook for 20 to 25 minutes or until mixture is creamy and all liquid is absorbed. Stir in cheese and next four ingredients and whisk until cheese melts and ingredients are blended. Remove from heat and cool slightly, about 5 minutes. Pour grits onto a parchment paper lined 18-x13-inch baking sheet; smooth into an even layer. Let cool completely. Cover and refrigerate until very firm, at least 2 1/2 hours or overnight. Line a baking sheet with parchment paper or foil coated with nonstick cooking spray. 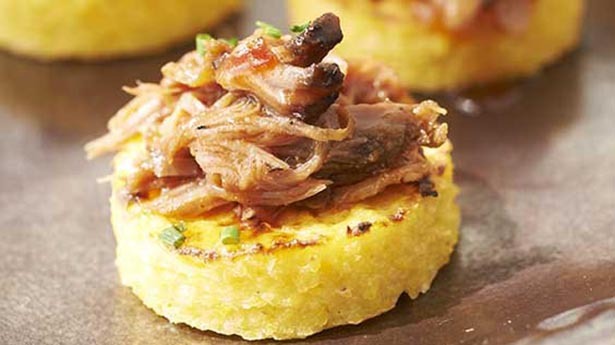 Transfer grits cakes to non-stick baking sheet, broil on low just prior to serving for approximately 5-7 minutes or until lightly golden brown. Top with desired topping of barbecue or turnip greens and garnish with scallions or chives, if desired. Note: Nutrient analysis is for grits cakes only and does not include topping.